Hi Bob and crew, Thanks for all your work in answering questions. I have an Bartlett's Anthias with one severe Popeye. He is the dominate Male in a group of three. He had PopEye a week ago and it appeared to go away. Just today the PopEye was back and I wanted to see if using Epsom salt in the display tank is the proper course of treatment and how much to use. If not the proper treatment do you have any suggestions. I had recently added several new coral frags 9 days ago I added corals and a few days latter he got PopEye. The PopEye looked like it went away and he appeared to get better. 4 days ago I added several other new frags and now he has it again and he is perching on my live rock. He has been dominate and chases the other Anthias around. I am thinking my moving things around may have caused him to get injured. Maybe ran into something or chases them different because of new additions. Other changes to the tank have been my calcium was 350 and my alkalinity was 8.4 DKH and I have been raising it up to 450 and I overshot to 490. My tank has 116 gallons of water and I had added 20 ml of calcium on one day calcium went up to 400 and my alkalinity remained 8.4 DKH. I waited 2 days and added another 12ml and calcium went to 490 and my alkalinity went to 7.6 DKH. I did a 10% water change and my calcium went to 465 and my alkalinity went to 8.7 DKH. all my other reading were consistent Temp 77 degrees, PH 8.4, specific gravity1.024. Will I have any issues using Epsom salt in my display to treat the fish? Is this treatment effective? My 6year old Koran angel developed a foggy eye. but should I put something in the water to protect my angel against bacteria infection? Do you have something to suggest I use ? I saw a spectacular Asfur Angel specimen at the LFS today. Except, it had unilateral Popeye. It is about 5-6" long. The owner, who posts source and acquisition date for each specimen on the store, states they have spend hundreds of dollars to eliminate this over time, but it has persisted for the 2+ years they have had this fish (i.e., the longest resident of the store). I read the FAQs on Popeye, but didn't see any mention of whether Popeye in a juvenile fish may persist into adulthood (for example, would they outgrow it). If this specimen has had it for years, it seems unlikely it will ever change? Any thoughts? I have a pair of spawning clarkii clownfish and the female clown just developed PopEye. I set up a hospital tank and was going to relocate and medicate this evening. She is still active, eating and spends the day with the male preparing the nest for the next batch of eggs. I suspect the PopEye is due to water quality / high nitrates. About 2 months ago when they first were preparing to lay eggs they completely disturbed the sand bed. I went from having a 3" sand bed all around to a 6" sand bed across the front and almost bare glass in the back. They created themselves a hole to nest and lay their eggs. My question is should I relocate the male with the female to the hospital tank? I wouldn't want to stress him any more than I need to but I think losing his mate would stress him more than the treatment. They would be paired in a 10 gallon tank for the duration of their treatment. Thanks again for your dedication! Reading the dailies is one of the high points of my day (and I MUST stop doing it at work!!!!). After reading Josh's reply to the Clownfish with PopEye questions I felt I must share my experience. I've had 2 Clarkii Clowns come down with this condition at two different times/systems, one of which went through several cases of it over the period of about a year. I'm not sure what medication would be suggested for PopEye but I have noticed that with optimal water conditions (with careful and frequent testing) and a high quality and varied diet, this problem is easily resolved with this species. This is one of my favorite types of clownfish and mine are still doing very well! One is about 3 years old and the other being 5 years. 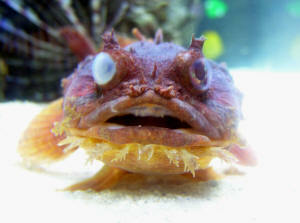 I have no experience with PopEye for other marine species and the case may very well be quite different for other fish. In my experience, this is not a problem that needs to be treated with Clarkiis if tank conditions and diet are good. Thanks again for your efforts and dedication! !